Wayne’s World (1992) Sub-Review – Stuff and That. 2016, eh? It’s weird to think 2006 was ten years ago. I may have woken up at about half two this afternoon, but staying up late was worth it because in the middle of it all was Wayne’s World. Funnily enough, I’d never before watched it, so I was in for a good first watch. Wayne’s World is stupid. But in a good way. 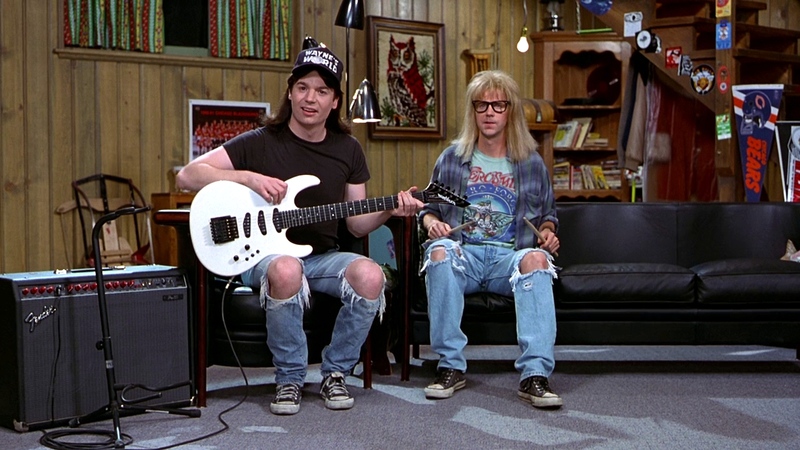 Mike Myers and Dana Carvey are brilliant as the two main characters, the idiotic metal-heads still living with their parents, acting like teenagers; with each character – Wayne and Garth – providing laughs ranging from the extreme close-up right at the start, to the product placement scene. In fact, I would say the two are geniuses as of their performances, and the writers are for providing them with such a hilarious script. The wider cast is important too, with many of them helping towards some more funny stuff; which is what this stupid film is all about – as the ridiculous plot further proves. Wayne’s World is one of the funnier films I’ve seen, with a stupid plot, stupid characters and a couple of geniuses behind it all to make it stupid in the best way possible. Mike Myers should have won an Oscar for his performance here. If you haven’t watched this, watch it now. What stops it reaching 90 is the film doesn’t provide laughs quite consistently enough to reach such a high score.